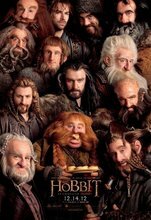 Bilbo Baggins, a hobbit of Middle Earth, reluctantly agrees to a long journey with an assemblage of dwarves to save their homeland from the dragon Smaug. With stunning eye candy, the story drawn out and perhaps too blunt, but with more humor than the Lord of the Rings trilogy. Tolkien purists may consider the film to be an unwarranted bastardization of the novella. Nominated for Academy Awards for Best Visual Effects, Best Makeup, and Best Set Decoration.